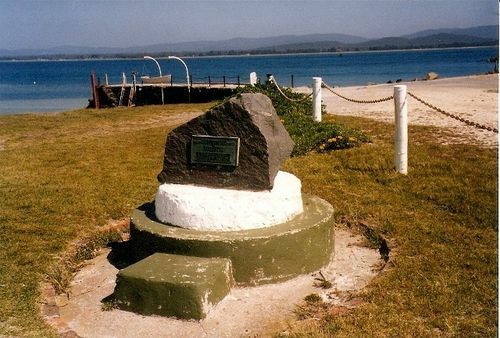 A plaque commemorates the European discovery of Port Dalrymple by the explorers George Bass and Matthew Flinders. In 1798, Bass and Flinders set off in the Norfolk to sail around Van Diemen`s Land. It stands on the foundation of the original front SRA reach leading light. The Norfolk was the first boat to be built in the colony and was built by the prisoners on Norfolk Island. Bass and Flinders discovered and explored the Tamar River. They then spent another three weeks mapping the north coast of Tasmania before they sailed down the west coast. They sailed down the Derwent River where Hobart now stands and then set sail for Sydney. They had proved that Van Diemen`s Land was an island by sailing right round it. Flinders named the strait, Bass Strait, after George Bass. This plaque commemorates the discovery of Port Dalrymple by Bass & Flinders November 3, 1798. It was unveiled by the Master Warden of the Port of Launceston Authority T.A. Barrenger, Esq, on November 3, 1985 and stands on the foundation of the original front SRA reach leading light.